Profile - Complete Dewatering Systems Pvt. Ltd.
With over three decades of experience (CDS) provides complete dewatering solutions to Its customers, CDS has established a wide clientèle around the world. While accolades and awards have followed its achievements, it strives to satisfy customers for all their requirements. Excellence has been a hallmark of its services. 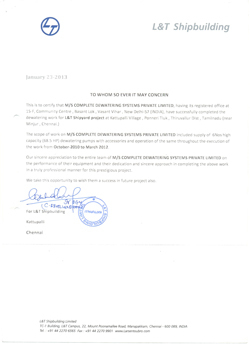 It is committed to delivering the same to its customers in the future as well. Over three decade long presence in the industry has been a time of growth and innovation. CDS has consistently looked towards the best in the industry and striven to achieve their benchmark standards in its work as well. It has considerably enriched that expertise, by involving itself in diverse projects around the world and across industries. While technology forms the core of operations,of CDS it is the excellence of its team that drives it continually forward in the industry. CDS Managing Director, Mr. Anil Kumar Bishnoi personifies the high standards of excellence which symbolizes the organisation. He is a Civil engineer (BHU 1968), and has also attained his Masters' in Building Construction from the University of Florida in 1971. 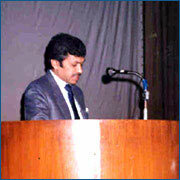 He has considerable experience in the design and execution of projects in India and the U.S.A. He leads a dynamic team of a large number of operators, supervisors, & engineers who have experience in a variety of projects. Over the years CDS has built up a strong base in export and provide our products and service to customers around the world. High quality standards in dewatering equipment & services have been appreciated by a global clientèle in the most developed markets of the world such as Malaysia, Singapore, & U.S.A, Canada. etc. 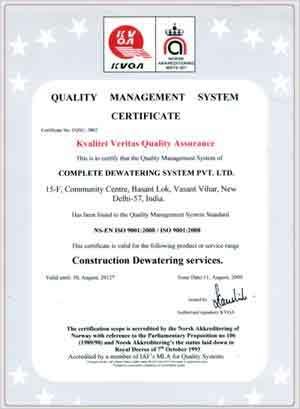 Complete Dewatering Systems Pvt Ltd - An ISO 9001 Company has been providing innovative solutions with the help of their Dewatering equipment and services to the construction industry and has been playing a major role in the development of infrastructure projects in India for over three decades. 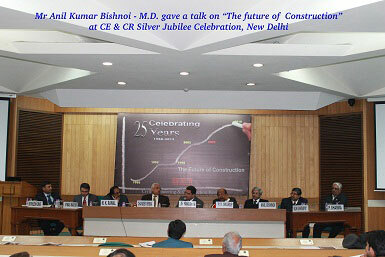 The scenario of Indian Construction industry is rapidly changing with many mega projects, some already implemented and many more are on the anvil. Complete Dewatering Systems Pvt Ltd has shaped many dream projects in sectors, like power, roads, bridges, airports, canals, dams, refineries, steel plants, nuclear power, hydro power, thermal power, metro rail, multi story buildings, transmission lines, ports & jetties, IT parks hospitals, mall & mega malls universities and chemical plants, hotels, industries, telecommunication etc. 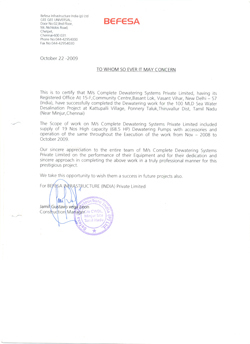 Complete Dewatering System Pvt Ltd has earned a very high reputation in construction industry by successfully executing over thousands of projects. Not surprisingly, you will find our equipment in almost all prestigious construction projects with major business players like: Larsen & Toubro, Patel Engineering, DLF, Befesa, Tata, Shapoorji, NTPC, NHPC, NPC, Kirloskar, GMR, CCCL, Simplex Infrastructure, Gannon Drunkenly, JMC Projects, Gammon India, Afcons, Punj Lloyd, Sadbhav Projects, Progressive Construction, Reliance Industries, ITD Cementation, Som Dutt Builders, D.S. 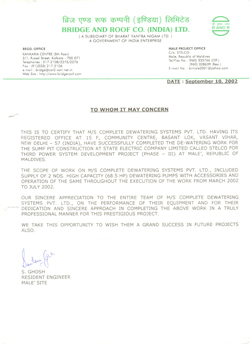 Construction, Soma Enterprises, Ramky Infrastructure, IVRCL Infra, Era Construction and Bridge & Roof. Our company maintains a large inventory of dewatering equipment both diesel as well as electrically operated. It also boasts of a big pool of trained operators & supervisors who have an average of over 20 years' of field experience. Complex job are specifically engineered and designed by highly qualified and experienced personnel headed by Mr. Ajit Bishnoi and Mr. Anil Bishnoi, who have done their Master of Science degree in Building Construction with specialization in Construction Dewatering from the University of Florida, U.S.A.